Explore la Catedral de la Sal de Zipaquirá, una de las maravillas arquitectónicas más inesperadas de Colombia, durante esta visita guiada. Diríjase a la mina de sal de la ciudad, bajo tierra, donde descubrirá este monumento único al ingenio humano. De vuelta a la superficie, disfrute de un almuerzo colombiano incluido y un recorrido por el centro colonial de Zipaquirá. Explora Zipaquirá y su notable Catedral de Sal. 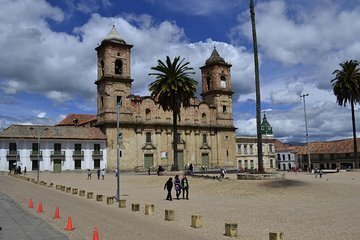 Visite el centro colonial de Zipaquirá, que incluye la Plaza de la Independencia y una de las iglesias más antiguas del país. Incluye un almuerzo típico colombiano. Reciba un recojo de su alojamiento en Bogotá mientras viaja entre 60 y 90 minutos a Zipaquirá para comenzar su recorrido por la catedral. Cuando llegue a la ciudad, descienda bajo tierra para descubrir la arquitectura moderna única de esta estructura religiosa, aprendiendo sobre su construcción y características clave. Cuando regrese a la superficie, disfrute de un almuerzo colombiano incluido de carne, pescado o opciones vegetarianas. Pase el resto de su visita explorando el centro colonial de Zipaquirá, que incluye una de las iglesias más antiguas de Colombia y la Plaza de la Independencia. Regrese a su alojamiento de Bogotá al final del día. We spent 10 days in various parts of Colombia and the salt cathedral tour was one of our favorite tours. Our guide was incredible and the cathedral was mind blowing. Do not miss it! This tour was a lovely way to spend the day. The Salt Cathedral has voice guides so you can tour at your own speed. The guide provides insight into the history of Colombian during the square tour and the lunch is a great way to try a traditional Colombian lunch. This tour is a must! The Salt Cathedral was spectacular and Independence Square was definitely worth seeing. Our guide was friendly and knowledgeable but not very talkative, so we had to ask a lot of questions. Overall good experience, but other group tours may be a better value. Great day trip if you've already spent some time in Bogota. It does take a while, though, so not ideal if you only have 1 day in the city. Excellent tour with very knowledgeable tour guide. The tour starts with a pickup from your hotel, and away you go to The Salt Cathedral! Our guide was Andrea and we had a good conversation throughout the tour. Lunch was provided in Zipaquira and it was good local fare. This tour is recommended! We were picked up from our hotel in Bogota by 9 am and we reached Zipaquira within an hour. The tour in the Salt mine and Cathedral was in English and it included a movie and light show. Total it took 2 hours to complete the tour and on our way back we stopped at the Main square. We also enjoyed the Vegetarian lunch provided at a restaurant in Zipaquira itself. We returned to Bogota by 3 pm. It was a worthwhile tour and well arranged. The guide and driver both were very helpful. THE SALT CATHEDRAL IS A MOST SEE WHEN VISITING BOGOTA. THERE IS A SENSE OF PEACE AND TRANQUILITY EVEN THOUGH THERE ARE SOO MANY OTHER GROUPS IN THE CAVES. IT WAS A TRULLY AMAZING EXPERIENCE.